“My office is littered with “parenting books.” If we went by sheer number of pages of advice available, I should be the best mother around — something that the kindergarten teacher who, just this morning, told me that if I’d just bring her a comb, she’d do my youngest daughter’s hair, would be the first to say I’m not even in the running for — and that was before we both spotted the giant hole in the same child’s pants. The books, as abundant as they are, aren’t helping. “This is a busy parent’s time management guide, demonstrating how to find balance, turn “minutes into moments,” develop reliable parental intuition, and transform everyday routines into special times, without neglecting personal and professional responsibilities…Time passes all too fast, and when the kids do leave home, readers who followed Rotbart’s blueprint will greet their children’s departure with satisfaction of a job well done and the acknowledgment thereof”. –Jeffrey Zaslow, New York Times bestselling coauthor of The Last Lecture; and Moving On columnist, The Wall Street Journal. 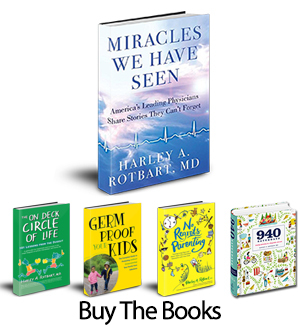 –Harvey Karp, MD, creator of the New York Times bestselling books and DVDs The Happiest Baby on the Block and The Happiest Toddler on the Block. –Marianne Neifert, M.D. (Dr. Mom®), author of the bestselling Dr. Mom books for parents. –Stacy DeBroff, bestselling author of The Mom Book, The Mom Book Goes to School, and The Mom Central Organizer; CEO and Founder, MomCentral. –Stephen Berman, MD, F.A.A.P., Past President, American Academy of Pediatrics; author of Getting it Right for Children. “Recognizing that time is a precious commodity for every parent, Rotbart provides sage advice to enable parents to maximize the time with their children and transform minutes spent to moments shared. Germ Proof Your Kids combines common sense and real science to answer parents’ most pressing questions about their kids and germs, helping us to feel both informed and protected – which will hopefully mean less school missed due to ear infections and Strep throat! After reading the book, it can easily serve as a reference for looking up anything that might be ailing your children. With both up to date information on disease prevention and age-old techniques perfected and used by many generations past, this is the medical book all moms want to have. “Rotbart, internationally respected pediatrician and infectious diseases expert, has no end of scientific knowledge on combating childhood diseases…Reconciling scientific and traditional approaches is at the heart of Rotbart’s new book, Germ Proof Your Kids: the Complete Guide to Protecting (without Overprotecting) Your Family from Infections…The result is a valuable guide brimming with practical advice and technical information, ideal for physicians and parents alike.Germ Proof Your Kids is written in a logical progression that first defines the “germ enemies,” explains the diseases caused by those germs, and then provides information on prevention and treatment of those diseases. Readers will come away with a full picture of why germs cause diseases and the steps they can take to keep their children safe. However, with such chapters as “Sanitary Sanity” and “Prudent Paranoia,” Germ Proof Your Kids is also intended to prevent parents and physicians from waging a full-scale war on germs. March 13, 2012 – The Parent’s Plate Radio Talk Show. 10:00-11:00 a.m. EST. Host Brenda Nixon. www.toginet.com. April 27, 2012 – Connect with Julianna Radio Talk Show 4:00-5:00 p.m. EST Host Julianna Lyddon. www.toginet.com. May 1, 2012 – Palo Alto PTA consortium Palo Alto, CA. April, 2014– Parents Magazine ParentsPerspective – What are Our Kids Really Thinking?